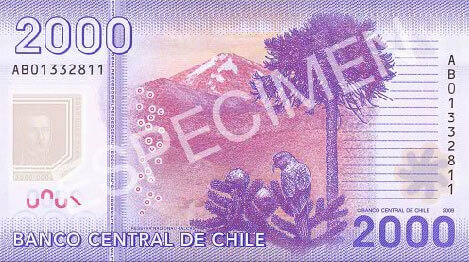 In 2004, the Central Bank of Chile released a new version of the 2000 Peso banknote. This included many more security features and is made of a more durable plastic material. Complex Window: At the left on the front (at the right on the reverse) there is a transparent inset forming a window which shows the number “2000” in relief. The window is surrounded by degrees of shading that vary according to how the note is moved. Second Window: A second smaller transparent window is placed at the right on the front of the note (at the left on the back). Watermark: Portrait of Manuel Rodríguez Erdoyza facing the center of the bill. 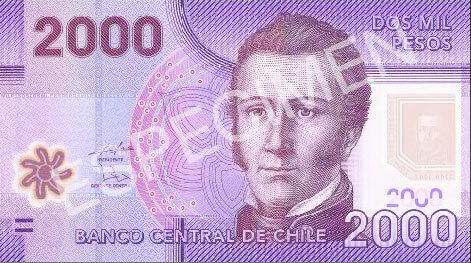 Security Strip: Vertical spanning the entire height of the bill repeating the words “TWO THOUSAND” (“DOS MIL”). Colors: Varying shades of blue, violet, carmine, ochre, and orange. Printing: Offset, intaglio, letterpress and varnish after printing. Face: The principle motif is a portrait of Manuel Rodríguez Erdoyza next to the image of a monument of Manuel Rodríguez Erdoyza by chilean sculptor Blanca Merino Lizana. Reverse: The main image is of the Church of the Dominicans (la Iglesia de los Dominicos). Colors: Blue, ocre, orange, and others in distinct shades. System of Impression: Offset, Taille Douce and typography..
Face: The principal motif is a portrait of Manuel Rodríguez Erdoyza next to the image of a monument of Manuel Rodríguez Erdoyza by Chilean sculptor Blanca Merino Lizana.